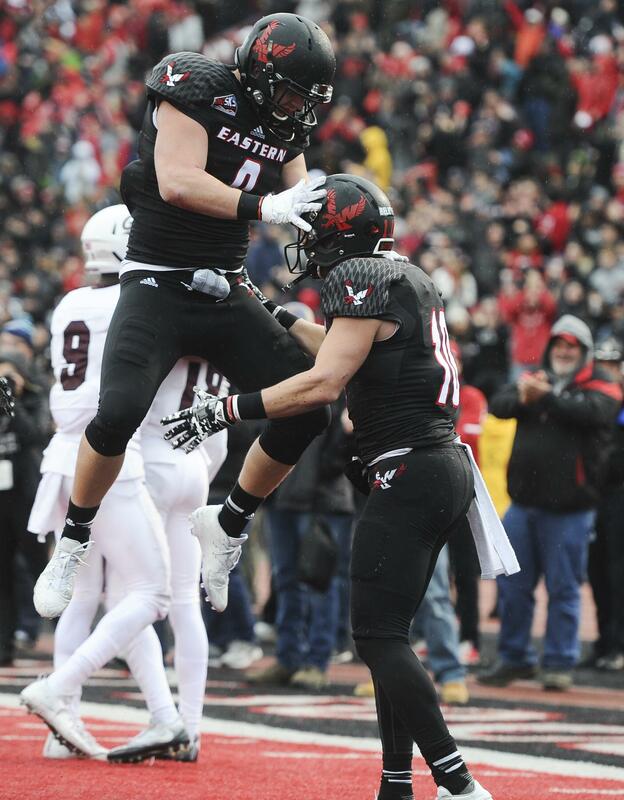 An exceptional year by two Eastern Washington football players was repaid on Tuesday by the coaches of the Big Sky Conference. For the first time in league history, two players from the same team are the Big Sky offensive players of the year, as senior wide receiver Cooper Kupp and sophomore quarterback Gage Gubrud were honored by the league office. “It was a unique situation and I thank the coaches in our conference,” said Eastern coach Beau Baldwin, whose team is heading to the FCS playoffs with a 10-1 record and a No. 2 national seed thanks partly to the efforts of Gubrud and Kupp. Both were unanimous selections as first-team selections in the league, with Kupp also becoming just the fourth player in league history to earn first team all four seasons. Eastern had a league-high seven players selected to the first team – including four players on Eastern’s resurgent defense – and a total of 13 players overall were honored. The reigning Payton Award winner and Offensive Player of the Year in FCS, Kupp repeated as MVP after catching 91 passes for 1,297 yards and 12 touchdowns. Gubrud took over as EWU’s starting quarterback this season and passed for 4,071 yards and 40 touchdowns, and was the team’s leading rusher with 463 yards and four more scores. Eastern players have now been selected as the Big Sky Conference Offensive MVP in 12 of the last 16 seasons, including six of the last seven. One of only 10 repeat winners in league history, Kupp in 2015 became only the second wide receiver in 42 years to win the honor. Kupp is the first wide receiver and just the fourth player overall in the 54-year history of the Big Sky Conference to earn first-team All-Big Sky honors four seasons. Kupp and Gubrud were joined on the first team by senior wide receiver Shaq Hill and four defensive players: senior linebacker Miquiyah Zamora, senior safety Zach Bruce, senior defensive end Samson Ebukam and junior defensive tackle Jay-Tee Tiuli. A year ago, no EWU defensive players earned first-team honors and this year that side of the ball had more than the vaunted Eagles offense. Honored on the second team were senior wide receiver Kendrick Bourne, sophomore center Spencer Blackburn and Kupp as a return specialist. Third-team honors went to junior cornerback Nzuzi Webster and honorable mention was given to sophomore safety Mitch Fettig, offensive tackle Nick Ellison and freshman offensive tackle Tristen Taylor. Hill, the first player in school history to win four Big Sky Conference championships, was honored for the fourth year as well. He earned third-team All-Big Sky honors in 2014 and honorable mention in 2013, and was honorable mention as a return specialist as a freshman in 2012. The 2012 graduate of Brookside Christian HS in Stockton, California, had 65 catches for 1,014 yards and 15 touchdowns in the regular season. Eastern’s defense allowed only 24.4 points per game (195 total, second-best in the league) during its 8-0 Big Sky Conference start after allowing 40.7 against three challenging nonconference opponents. Eastern outscored opponents by an average of 21.0 points per game in eight league games (45.4 to 24.4, total of 363-195). The Big Sky All-Conference team is selected by the Big Sky’s head football coaches. Coaches were not allowed to vote for their own players. The conference’s Coach of the Year award will be announced on Wednesday. Published: Nov. 22, 2016, 11:41 p.m.